500mm No Waiting Cone. No Waiting symbol marked on the sleeve. 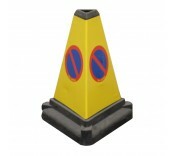 Manufactured in one piece from..
500mm Triangular No Waiting Cone No Waiting symbol marked on all three sides. One-piece desig..
530mm Triangular No Waiting Cone. No Waiting symbol embossed on all three sides. This 2-part ..
At Manchester Safety, we have no waiting cones that are both triangular and cone-shaped, that come in 3 different sizes. Their intended use is to indicate 'no waiting' for road users. 'No waiting' means that a vehicle is not to stop in the indicated area, and so these cones are primarily used to prevent drivers from stopping and obstructing others on the road, and therefore to maintain a constant flow of traffic. Additionally, yellow is the most noticeable of the colours, therefore it is effective in its use here to get somebody's attention. An area consisting of 'no waiting' cones, means no waiting or loading at any time for all vehicles, unless otherwise indicated. They can also be used to section off controlled or restricted parking zones, but other information would have to be included to make this clear for a driver, rather than only no waiting road cones without any other information. A driver can still pick up or drop off passengers in the presence of a no waiting cone (a 'clearway' sign would be used to prevent this from happening). Our 450mm no waiting cones are manufactured from one piece of heavy duty recycled material. The 500mm triangular no waiting cones are also manufactured from heavy duty recycled material and are also a one-piece design. They include the 'no waiting' symbol marking on all three sides. The 530mm triangular no waiting cone also contain the 'no waiting' symbol embossed on all three of their sides' surfaces, are manufactured from a one piece UV stabilised polyethylene (reducing weather damage), and include a sand weighted base for extra support.